LORENTZ-HF, the high frequency version of LORENTZ, is an easy-to-use 3D full-wave electromagnetic simulator based on CFIE (combined-field integral equation) combined with the ability to analyze charged particle trajectories in the presence of high frequency electromagnetic fields. It uses the Method of Moments (MoM) (or Boundary Element Method) coupled with Physical Optics found in SINGULA and is coupled with the ray tracing and powerful emission regime and secondary emission capabilities of LORENTZ. LORENTZ-HF also calculates near and far field results, power and directive gain, radar cross-section, axial ratio, and input impedance, admittance and scattering parameters. It is uniquely suited for early-stage simulation and resolution of the Multipactor Discharge phenomenon affecting many high power vacuum electronics device designs. LORENTZ-HF can also be combined with electrostatics, magnetostatics and time-domain solvers for LORENTZ-HFE, LORENTZ-HFM and LORENTZ-HFTD. LORENTZ-LF, the low frequency version of LORENTZ can be combined in a similar way for LORENTZ-LFE and LORENTZ-LFM. Physical Optics hybridized into MoM to solve problems such as large antenna dishes that basic MoM or FEM cannot handle. Full secondary emission is available with a probabilistic chance of emission depending on primary impact energies. Particle interaction with gravity, viscosity and mobility, scattering through residual gas collisions. Sources include: Incident plane wave, delta voltage, line voltage, waveguide, and magnetic frill. A wide range of graphs & plots (near field, far field, rectangular, Smith Charts, radiation patterns) can be created based on parameters such as H, B, E, D, J, Z, S, Y. Display rectangular plots of current, fields and input impedance. Display polar plots of power gain, contours of currents and fields. Display 3D surface plots of radiation patterns and display Smith charts of s-parameters. Export results to text files. Powerful parametric section enables user-defined changes to model geometries, materials, boundary and voltage conditions etc. Various emission regimes, including: Fowler-Nordheim, Child’s Law, Richardson-Dushman, Schottky and Extended Schottky. 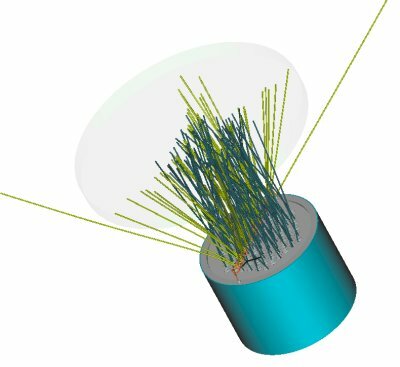 Simulate lens focusing properties, beam emittance and space charge. What hardware configuration advice can you give for optimal performance? What hardware configuration is required for optimal performance? A minimum of 4 GB of RAM is required. Although the software runs on single-processor machines, running it on multiprocessor sustem will allow the software to solve in a parallel fashion utilizing parallel resources. For most of our customers, this announcement has no relevance as most companies have standardized hardware requirements that fit or exceed the 64 bit operating systems required by our company. INTEGRATED’s development tools used for advancements require the installation of 64 bit systems*. Experience the full power of our simulation tools. Automatically reduce the solution time. By running the software in a 64 bit system, the system is able to make more effective use of available RAM. The performance of the simulation is greatly affected by the power of the computer in use. *The suppliers of the software tools we use have this requirement for us as well. Determine the size of problems you will be solving. This is reported in the Message Area as required disk space when the BEM solver begins. It is also reported for the existing element distribution from the menu Solution>Elements>Problem Size. The model took 6 hours to solve on a basic system and 3/4 hour to solve on a good system. There are many differences between the 4 systems used, leading to some noise in the plot. However, it is clear that the optimal solution is to use a 64 bit version of the software with more RAM available than the reported memory requirement. 2 hard drives: When choosing hard disk features access time is clearly important. You can set up the locations of the scratch files from Utilities>Settings. Out of various configurations we tested, this was the single most important factor in performing faster analyses when the memory required exceeded available RAM. RAID ARRAY: using a RAID array lets you use multiple disks as a single drive letter, but will manage the access very efficiently. We configure our own systems such that IES software is installed on d: (a RAID array) with the program and scratch files using d:. For more generic information about configuring a RAID array on your computer, check HOW TO: Establish a Striped Volume (RAID 0) in Windows Server 2003 (Microsoft Knowledge Base).